In this paper, we use a real-world case study to illustrate the signs of an in-danger RC that can be overlooked. 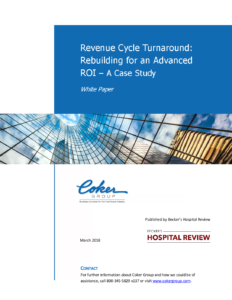 Further, we explain how Coker helped one organization turn around its Patient Accounting System resulting in a 14 to 1 return on investment (ROI). We will review the health system’s situation to show their struggle with their RC as a newly-hired Chief Operating Officer (COO) questioned why things were not moving ahead smoothly for the several-hundred provider organization.